Nanogen is a total new brand to me but when they contacted me I was really interested. I definitely don't have an issue with growing my hair. If you know me you'll know I very rarely get it cut. I grow it super long and then chop it straight back off again. I always have the theory that if I don't like it, it'll grow back, right? I think more of us should have that theory, but with some people finding it hard to grow their hair back I was really interested in products that could potentially help that and stop us from being a little less adventurous with our hair cuts just because we're not sure how long it'll take to grow back. 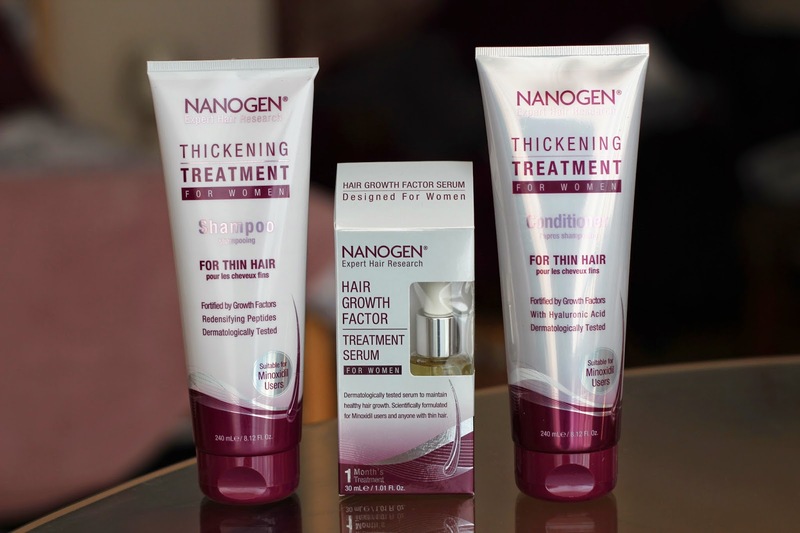 The Nanogen Thickening Treatment Shampoo* and Conditioner* is for thin hair and is supposed to do exactly as it says, thicken your hair. I really wanted to try this out properly as I'm forever on the hunt for things to thicken and volumise my hair and thought this was a great chance to sort it out but unfortunately I just couldn't deal with the smell of it. It smells super medicated and although that probably means that it's doing something I just couldn't work through. If you can't use products that you don't like the smell of then I'll say that this is unlikely going to be for you, but if you do really want thicker hair and can work through it then I'd definitely say to give it a go. The Nanogen Hair Growth Treatment* was one that interested me so much, but I knew that it definitely wasn't for me as my hair grows quick enough anyway and so I doubt I'd actually be able to tell the difference and so I picked on my trusty friend Lettie who was growing her hair out and struggling and gave her the product to give it a good ol' go. She has had pretty short hair for quite a while now and recently finally came the time to grow it out, and I have noticed a difference. Her hair is growing, whether or not the product has really helped I'm not too sure, but it is growing and I can't see how using this product is hindering that. Get it and give it a go if you really do want to grow your hair, it can't hurt right?